Camping is a favorite summer activity for families and solo adventurers, alike. The right tent is like a cozy home-away-from-home that can enhance your getaway. Choose the wrong tent, and you will be in for a long night, and an even longer trip. If you do not want to wake up on the wrong side of your sleeping bag, follow this buyer’s guide to finding the perfect 2 person tent. 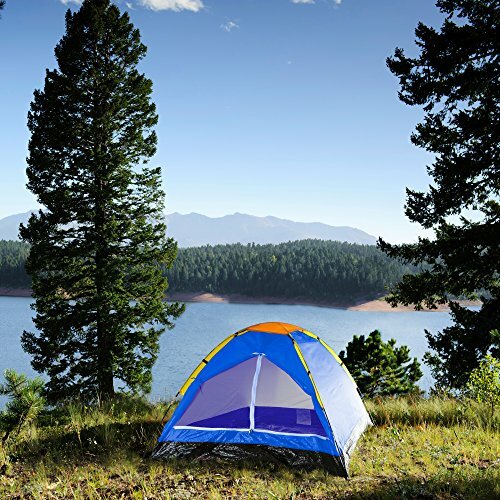 When choosing a tent, you should consider the tent’s sleeping capacity, its seasonality, and any notable features that separate one tent from its competitor. Generally, you want a tent that is versatile and made with durable materials. The first thing you should do is determine how how much space you will need for people, pets, and supplies. You may want to consider if anyone in your party has claustrophobia or is prone to tossing and turning in their sleep. Furthermore, the type of occupant you take with you also effects the amount of sleeping space you will get. A child, for example, generally takes up less overall space than an adult. Unfortunately, the tent capacity ratings are not standardized across brands. The best thing to do is to err on the snug side. The seasonality of a tent refers to the tent’s ability to stand up to the different climate conditions unique to each season. A 2-season tent can only withstand light wind and rain. A 3-season tent, on the other hand, can be used in spring, summer. 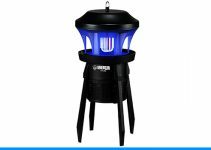 It can stand up to heavy rains and strong winds. A 3-4 season tent is designed for the wetter, more snowy conditions of early spring and late fall. A 4-season tent can be used in any weather conditions, including snow storms. Tents have become more and more customized and specialized. Tents can come in different shapes and roof heights and include vestibules, or an overhang outside the tent’s door used to store wet shoes or other gear you do not want inside the tent. Most tents come with a rain fly, a waterproof cover that covers the roof of your tent, which adds more protection from rainy, summer nights. Now that you know the basics, check out this in-depth review of the ten best 2 person tents. This budget-friendly 2 person tent is great choice a camper who wants something light-weight but packed with features. The Coleman Sundome tent measures 7 X 5 ft. with a domed roof with a height of only 4 ft. This tent has a free-standing design for quick and easy set-up and take-down. This tent sports two large mesh windows and one large door for maximum visibility and ventilation. 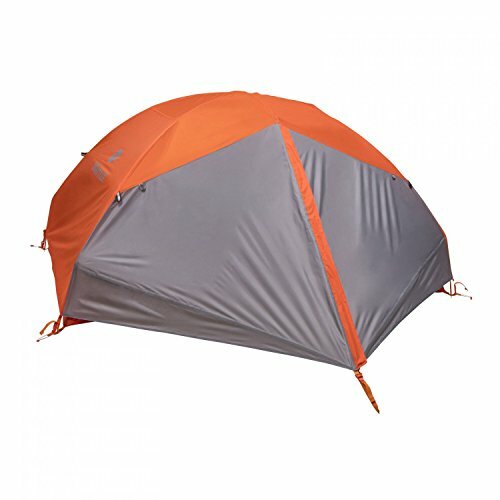 This tent does come with a polyester rain fly as well as welded seams to increase overall water resistance. The fabric is made from a durable polyester formula with reinforced threads to reduce the risk of tears and ensure that the tent will stand the test of time. 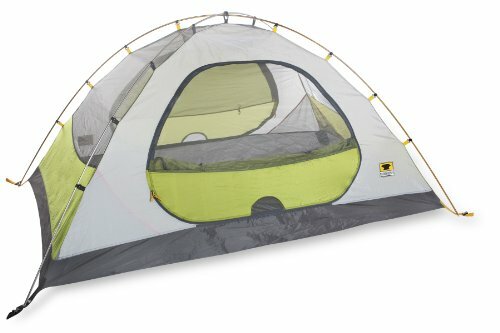 This unique tent offers two types of door closure options: mesh panels to increase air flow in the summer or nylon panels that provide privacy and protect against wild, rain, and other harsh weather conditions. The Luxe Tempo features two vestibule areas for additional storage space. The tent weighs around 5 lbs packed, measures 6.8 X 4.5 ft with a maximum height of 3.6 feet. Besides the price tag, the other draw back is you can only get the tent in highlighter yellow. They have no current plans of releasing it in additional colors. 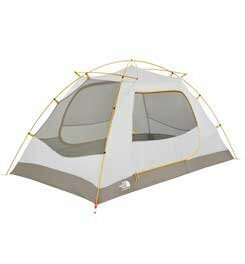 The Happy Camper 2 Person Tent is inexpensive, lightweight, and no frills. This tiny tent, coming in at 6 X 4.5 ft. and a maximum height of 3.5 ft, is barely big enough to fit a full size blow up mattress. What it lacks in floor space, it makes up in floor design. The floor is fully constructed and waterproof. This tent only has one entrance so there is less airflow than some of its larger, pricier cousins. 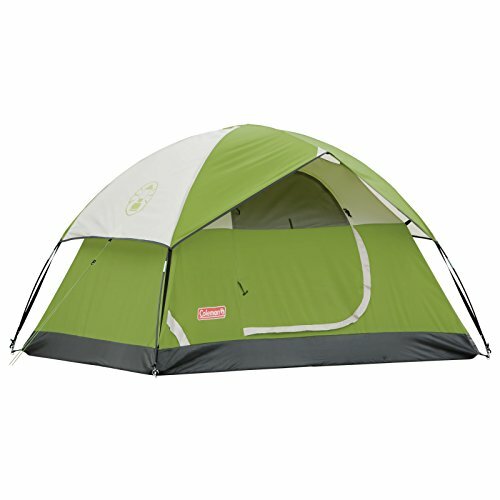 This tent is a great choice if you need to pack light and will be in temperate conditions. This 2 person, 3 season tent is designed to create as much free space inside the tent as possible. 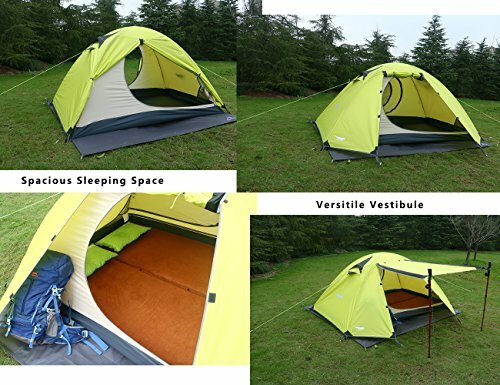 This tent has vertical walls and two D-shaped doors to provide ample sleeping space and easy ingress and egress. There are vestibules at each door for separate storage areas. The Marmot Tungsten also comes with color coded clips and poles to make set-up quick and easy. The ten weighs in at just over 4 lbs and comes with a durable, water resistant footprint to keep the inside of the tent clean. 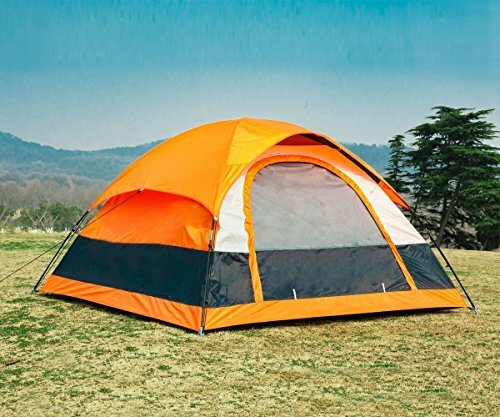 This tent features a lightweight design and a domed roof measuring just over 4 ft. There are large, mesh roof vents and windows that provide great views and ventilation. During fair weather, you will have a clear view of the sky. The tent is not water proof. There is a removable fly frame that you can put over your tent to cut down on rain.This tent runs 6.8 ft in length so it makes a great choice if you and you camping partner are on the tall side. This freestanding tent has an easy to use D-shaped door and mesh tent body that allows for cool breezes and plenty of star gazing. 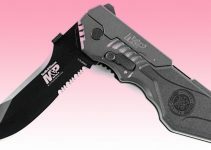 The Grand Mesa weighs in at 4 lbs and includes color-coded pole clips for efficient set-up and tear down. The tent does have one vestibule and multiple mesh storage pockets throughout the interior. 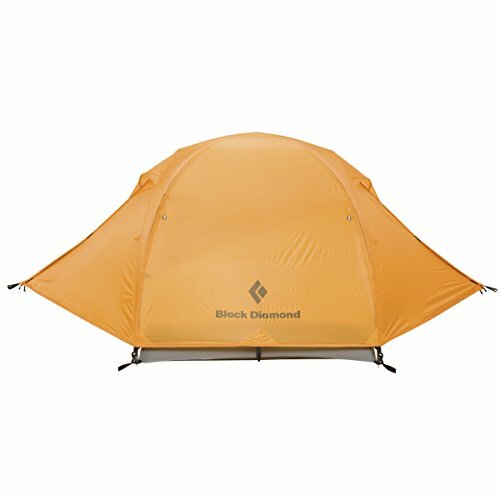 This tent is a great choice for backpackers or car campers. The Stormbreak 2 is a well-made, basic tent that offers the most bang for your buck. 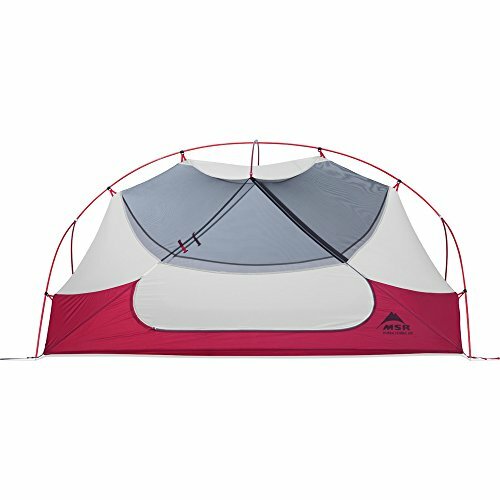 The tent has a fully seam-taped canopy and floor, two doors, and two spacious vestibules for gear. This tent is rated for 3 seasons The tent weighs 5 lbs packed so it may be best used on short hiking trips and at camp grounds. Furthermore, the tent does not include a footprint, so you may want to pick one up. This 3 season design has two doors, two integrated vestibules, and boasts 360-degree mesh views. The interior of the Black Diamond Mesa tent is spacious and very long (measures over 7 ft.). While the packed tent weighs in at almost 5 lbs, it can be converted into a smaller tent by leaving the body behind. You can combine a ground cloth (sold separately) and the rain fly for a sturdy, lightweight shelter for your backpacking adventure. The Hubba Hubba 2 person, 3-season tent weighs 3 lbs, has a maximum height of 3.25 feet, and a limiting 29 square feet of tent floor area. There are two vestibules on either side so you will not be woken or trampled on by your camping partner trying to get to his or her pack. It also includes two doors with built in rain gutters and a kickstand rain fly. The tent does not include a footprint or other floor mat. The MountainSmith Morrison 2 person tent is free standing and good for three seasons of use. The two door, two vestibule layout allows MountainSmith Morrison to optimize all 35 square feet of useable, interior space. 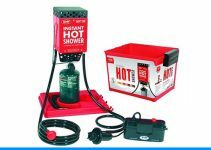 While it does not come with a footprint for your floor, it does come with a adjustable, cross-ventilating rainfly that will reduce the condensation buildup inside your tent.The maximum height is only 3.5 ft. 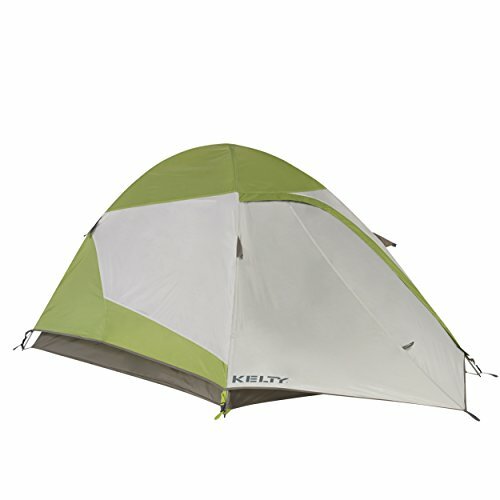 This tent is a great value for the cost and is best used for general hiking and camping.